EDGEFIELD, S.C. – Alva Holmes Jackson, age 94, passed away Monday, July 13, 2015. She was a loving faithful wife of fifty-eight years to the late Jesse Cromwell Jackson. Born November 11, 1920 in Edgefield, SC, Alva was the fifth of nine daughters of the late Cornelius Vanderbilt and Mattilee Schenk Holmes. She was a graduate of Edgefield High School and Lander University. 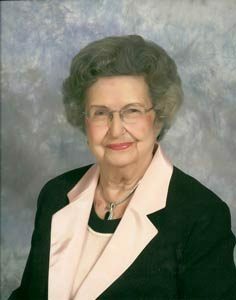 She spent the majority of her career as an accountant and bookkeeper at Pendarvis Chevrolet in Edgefield until her retirement. After retirement, she served as a volunteer with the Edgefield County Hospital Auxiliary. She was also an active member at Edgefield First Baptist Church, President of the Edgefield Garden Club, and various other community activities. She was most of all, a loving wife, mother, grandmother, sister and friend. As she always said, her family was her “heart”. She is survived by son, J. Keva Jackson and wife, Gail of Edgefield, SC; daughter Sandra J Cochran and husband, Doug of West Columbia, SC and daughter Milbra J Mundy and husband, Bob of Columbia, SC; seven grandchildren and five great grandchildren. She is also survived by her one remaining sister, Edith Holmes Petty of Clover, SC, along with many beloved nieces and nephews. Funeral services will be held at Edgefield First Baptist Church on Wednesday, July 15 at 11 A.M. with Dr Tim McClendon, her nephew, presiding. Burial will follow the church service at Eastview Cemetery in Edgefield. The family will receive friends one hour prior to the service at the church. The family wishes to extend thanks to Deepwood Estates, Lexington Medical Center Extended Care, and Compassionate Hospice for their care. Memorials may be made to Edgefield First Baptist Church “Gods Little Angels”, P.O. Box 624 Edgefield, S.C. 29824. Funeral arrangements are being handled by Edgefield Mercantile Funeral Home.